Building on the success of the first edition, which offered a practical introductory approach to the techniques of error concealment, this book, now fully revised and updated, provides a comprehensive treatment of the subject and includes a wealth of additional features. 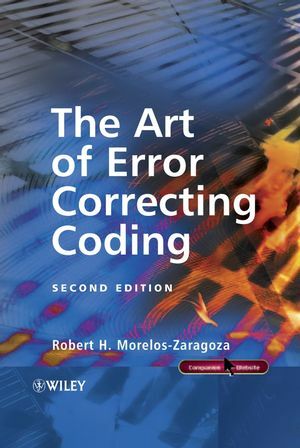 The Art of Error Correcting Coding, Second Edition explores intermediate and advanced level concepts as well as those which will appeal to the novice. All key topics are discussed, including Reed-Solomon codes, Viterbi decoding, soft-output decoding algorithms, MAP, log-MAP and MAX-log-MAP. Reliability-based algorithms GMD and Chase are examined, as are turbo codes, both serially and parallel concatenated, as well as low-density parity-check (LDPC) codes and their iterative decoders. This edition provides an essential resource to engineers, computer scientists and graduate students alike for understanding and applying ECC techniques in the transmission and storage of digital information. Robert H. Morelos-Zaragoza received BSEE and MSEE degrees from the National Autonomous University of Mexico (UNAM) in 1985 and 1987 respectively, and a PhD in Electrical Engineering from the University of Hawaii at Manoa in 1992. He has held numerous research posts in Mexico and Japan. In 2002, Robert joined the Department of Electrical Engineering at San José State University, as an Associate Professor. His current research interests include error correcting coding (ECC/FEC), advanced digital communication receiver design, software-defined radio (SDR), space-time signal processing techniques and ultra-wideband (UWB) communication systems. Prof. Morelos-Zaragoza is a senior member of IEEE, and member of IEICE (Japan) and of Eta Kappa Nu. 1.1 Error correcting coding: Basic concepts. 1.1.1 Block codes and convolutional codes. 1.1.2 Hamming distance, Hamming spheres and error correcting capability. 1.2.1 Generator and parity-check matrices. 1.2.2 The weight is the distance. 1.3 Encoding and decoding of linear block codes. 1.3.1 Encoding with G and H.
1.3.3 Hamming spheres, decoding regions and the standard array. 1.4 Weight distribution and error performance. 1.4.1 Weight distribution and undetected error probability over a BSC. 1.4.2 Performance bounds over BSC, AWGN and fading channels. 1.5 General structure of a hard-decision decoder of linear codes. 2. Hamming, Golay and Reed–Muller codes. 2.1.1 Encoding and decoding procedures. 2.2 The binary Golay code. 2.2.3 Arithmetic decoding of the extended (24, 12, 8) Golay code. 2.3.1 Boolean polynomials and RM codes. 2.3.2 Finite geometries and majority-logic decoding. 3. Binary cyclic codes and BCH codes. 3.1.1 Generator and parity-check polynomials. 3.1.3 Encoding and decoding of binary cyclic codes. 3.1.5 Shortened cyclic codes and CRC codes. 3.2 General decoding of cyclic codes. 3.5 Decoding of binary BCH codes. 3.5.1 General decoding algorithm for BCH codes. 3.5.2 The Berlekamp–Massey algorithm (BMA). 3.5.5 Chien search and error correction. 3.6 Weight distribution and performance bounds. 4. Nonbinary BCH codes: Reed–Solomon codes. 4.1 RS codes as polynomial codes. 4.2 From binary BCH to RS codes. 4.3.1 Remarks on decoding algorithms. 5.1.1 Recursive systematic convolutional codes. 5.2 Connections with block codes. 5.5 Decoding: Viterbi algorithm with Hamming metrics. 5.5.1 Maximum-likelihood decoding and metrics. 5.6.1 Implementation issues related to punctured convolutional codes. 6. Modifying and combining codes. 6.1.4 Augmenting, expurgating and lengthening. 6.2.1 Time sharing of codes. 6.2.2 Direct sums of codes. 6.2.3 The |u|u + v|-construction and related techniques. 7.1 Binary transmission over AWGN channels. 7.2 Viterbi algorithm with Euclidean metric. 7.3 Decoding binary linear block codes with a trellis. 7.6 Generalized minimum distance decoding. 7.6.1 Sufficient conditions for optimality. 7.8.2 Maximum-a posteriori (MAP) algorithm. 8.2.1 Parallel concatenation: Turbo codes. 8.3.2 Iterative hard-decision decoding: The bit-flip algorithm. 8.3.3 Iterative probabilistic decoding: Belief propagation. 9. Combining codes and digital modulation. 9.1.1 Examples of signal sets. 9.2.1 Set partitioning and trellis mapping. 9.2.3 Distance considerations and error performance. 9.2.4 Pragmatic TCM and two-stage decoding. 9.3.1 Constructions and multistage decoding. 9.3.2 Unequal error protection with MCM. 9.5.2 Turbo TCM with symbol interleaving. 9.5.3 Turbo TCM with bit interleaving. Appendix A: Weight distributions of extended BCH codes. The Art of Error Correcting Coding Website Visit the author's website to access computer programs in C/C++ to simulate basic algorithms for encoding, decoding and analyzing several classes of error correcting codes covered in the book.